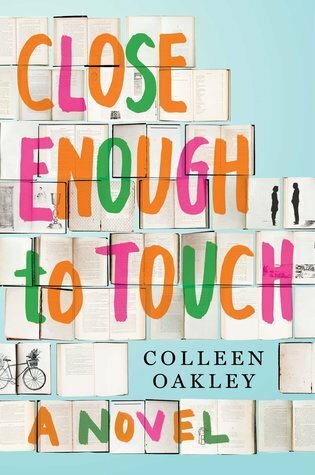 While browsing through the list of new books in our library, I came across Close Enough to Touch by Colleen Oakley. The blurb intrigued me. A story about someone who is allergic to people and cannot be touched? A scary thought. The novel centres around the character Jubilee Jenkins, a woman who has a rare condition (she is allergic to the human touch). After a nearly fatal accident, she becomes a recluse. Her mother’s death forces her to leave her home and find a job. This she does at the local library where she begins to interact with people. My teaser is near the beginning of the book. Her mother has died and Jubilee wishes to go to her mom’s funeral. “My shoulders begin shaking as my laughter mutates into crying. I’m not going to my mother’s funeral. Lenny will wonder where I am. Anything my mom’s told him over the years about my being a bad daughter will be confirmed. And while all of that is troublesome, another thought floats on the periphery of my brain, waiting to be let in. A terrifying thought. A thought that I realize maybe I’ve known deep down but haven’t wanted to admit to myself. But it’s hard to deny it when I’m leaning against the front door inside my house, unable to slow my heart or stem my tears or stop my body from shaking. And that thought it: Maybe there’s another reason I haven’t left my house in nine years. This novel was captivating and had me rooting for Jubilee. My heart ached for her as she fell in love and was unable to touch him as she wished to. There were many poignant scenes in this story; scenes which were beautifully written. This romance story is definitely not ordinary. I enjoyed reading this novel and would recommend it for anyone who is looking for a romance novel with a difference. Thank you. Your teaser suggests a tale that is nail biting. You will feel compassion in abundance. And so many scenes are written with compassion. Sounds like my kind of book. I love stories that are a little bit quirky or different and this definitely sounds it. It is. There is not much that is traditional about this romance story. It sounds like one where I need a box of tissues while I read it. I’d read this book. An interesting one! Don’t know the author, but I’ll check it out! I think she must be a new author as I haven’t seen any other books by her. This sounds like a great read with its novel storyline. I really enjoyed the novel Michelle. And it is unlike a story I have read before.